"Every child is an artist. The problem is how to remain an artist when we grow up." As the Oakville Art Society’s (OAS) 50th anniversary approaches in 2015, it seems appropriate to take a moment of reflection to look at how a small society, formed in 1965 (with just eight members), flourished under the guidance of Mrs. Esther Demeny. Today the OAS is a fully recognized non-profit organization and has hired its first full-time employee just a few years ago. 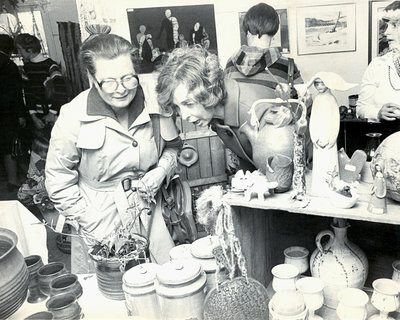 Through all of its growth, the Oakville Art Society would not have been able to sustain itself over the years had it not been for the generosity of its members and numerous volunteers. This essay is a tribute to their achievement in making fine arts viable in Oakville and surrounding area. •To create a forum where persons interested in art may meet to share ideas and enjoy mutual encouragement in art and art appreciation. •To provide the environment and facilities wherein artistic skills may be more fully developed. •To promote and encourage art appreciation within the community. •To provide bursaries and other assistance as, and when possible and desirable to the encouragement of suitable students.